Read this blog in Bahasa Indonesian . Tropical regions face an emissions challenge  from an important, but relatively little-known source: drained peatland. Peat soil, made up of partially decomposed, wet plant  material that forms over thousands of years, is highly concentrated  in Indonesia and Malaysia. Peatland in these countries has become a common target for agricultural expansion , particularly for oil palm, as fertile land becomes increasingly scarce. When land is cleared for plantations, the underlying peat needs to be drained, releasing CO2 into the atmosphere. In fact, the estimated annual emissions from peat drainage in Indonesia and Malaysia—the world’s two largest sources of tropical peat—equate  to emissions from nearly 70 coal plants, or the total annual emissions of Vietnam. Indonesia and Malaysia are among the world’s major emitters  (6th and 19th respectively). But their contributions to global emissions may be even worse than we think as most estimates  of emissions from land use and land use change leave out those from drained peatland. But that’s no longer the case with new data available on Global Forest Watch Climate . The new data and carbon emissions analysis feature lets users see how much CO2 is emitted from drained tropical peat soil each year within mapped plantation areas. Peatlands come in many forms, but tropical peatland is the most carbon-rich of its kind. Each hectare of tropical peat drained for plantation development emits an average of 55 metric tons of CO2 every year, roughly equivalent  to burning more than 6,000 gallons of gasoline. Recently published research  shows the area of industrial plantation expansion onto peatlands in Borneo, Sumatra and peninsular Malaysia increased 37 percent over just the past five years (235,000 hectares or 581,000 acres per year). In Kalimantan alone, the expansion more than doubled. 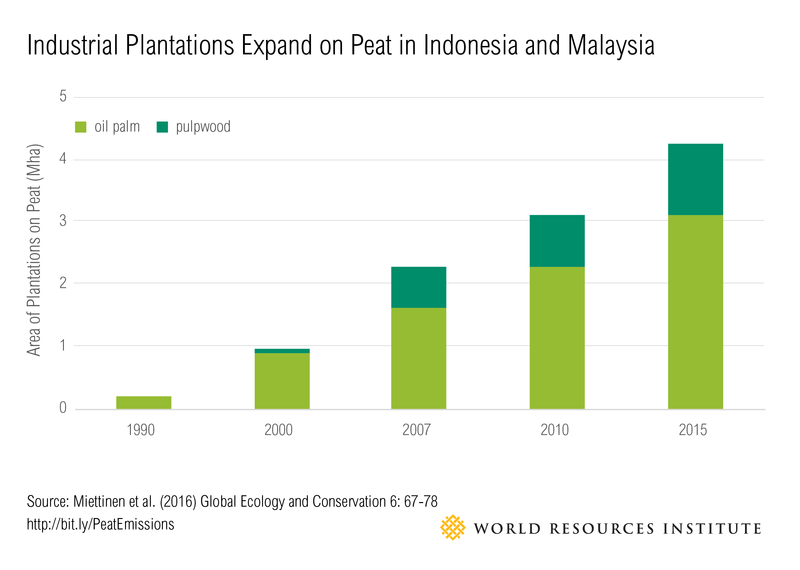 Today, plantations cover 5.2 million hectares (12.8 million acres) of tropical peatland in Indonesia and Malaysia, meaning that emissions from these drained areas total 263 megatonnes (Mt) of CO2 per year—equivalent to emissions from 70 coal plants. Peat forms under wetland conditions, where flooding causes partially decayed vegetation or organic material to accumulate over time rather than decomposing. As this organic material builds up over thousands of years at a rate about the thickness of a quarter every year, it retains even more water and acts as a giant sponge that holds moisture. Eventually, a dome of wet organic material forms that can rise above the surrounding flood levels. Tropical peat soils are found primarily in Indonesia and Malaysia, and can range in thickness from half a meter to more than 20 meters deep. With the accumulation of so much organic material, tropical peat soils store up to 20 times more carbon than other types of mineral soils. There is still considerable uncertainty  about the extent and depth of peat soils. The Food and Agriculture Organization provides estimates  of peat drainage emissions, but they come from imprecise datasets that have not changed since 1990, despite there being 15 times more agriculture planted on peat in Indonesia and Malaysia today. The Intergovernmental Panel on Climate Change (IPCC) recently released a guide  on how to estimate emissions from drained peatlands. GFW Climate  used this guidance as well as data on the type and location of plantations and soils to produce the first detailed map of where and how much CO2 emissions are occurring as a result of drained peat across Indonesia and Malaysia. The only way to prevent drained peat from emitting more carbon dioxide is to rewet the land. Doing so has the added benefit of preventing fires during the dry season, which themselves can be an additional catastrophic source  of emissions and air pollution. After last year’s record-breaking fires season, Indonesia’s President Joko Widodo set up an agency to restore about 2 million hectares (5 million acres) of peatland in four prioritized districts. While methods to restore the hydrology of dried peat continue to develop , decision makers must also implement stronger land-use policies to prevent their drainage in the first place. Last week, the Indonesian government announced a moratorium  on the issuance of new permits for oil palm and mining operations, including on peat. Policies can also target degraded land for agricultural expansion, which, if done right , can help restore landscapes while meeting consumer demands.